Is it better to be rich or to be wealthy? Yes, there is a difference. being rich and being wealthy. When I was working in ultra-high net worth individual wealth management, most of my clients were wealthy. While they had a lot of money, more importantly they had money flowing in from different sources every month. A lot of my clients own businesses which they had started from scratch. Others received royalty payments each month.And the list goes on. One my jobs was to maintain and grow their wealth. The easiest thing for me to do was to invest them into investments that paid dividends. These streams of income coming in month after month made my clients wealthy. You often hear when someone talks about the Poweball Lottery the expression "If I win the lottery, I'll be rich", there was even a song that said "If I had a million dollars, I'd be rich". You never hear "I'm going to be wealthy!" and for good reasons. Being rich does not mean you are wealthy. Rich means just having money in abundance at a given time. This money, once used, is gone. Think of the sports athletes and actors and even lottery winners who made so much money at one only to have to file for bankruptcy because all of their money was gone. They were rich at some point. Wealthy is defined as having enough money today as well as in the future and still have a great deal of residual coming in. Being wealthy is not just about having a lot of money. being rich in the pocket, but also about being rich in the mind. For most people, getting rich is the ultimate goal, but rarely to be wealthy. While money can buy you things you need to be happy, there is something so much greater than just having money. Family, health, intelligence, knowledge and patience all provide wealth of another kind. In my long experience as a wealth manager and working with all types of people, I noticed that most of them had similar traits. They were happily married and with the same spouse for many years. Divorce was rare. 99% of them had children and even grandchildren. They took care of their children financially not by giving them money, but provided for their education. Many business owner clients passed their business down to their grown children. They did not flaunt their money buying 6 cars or treasure chest full of luxury items here and there. In fact, you could walk right past them on the city sidewalk and not even know they were worth $300 million dollars. Perhaps most surprising is that they were nice people. It's not like you see with some celeberties or in the movies were they are mean, rude and think they are better than everyone else. They seemed to have overall happiness. 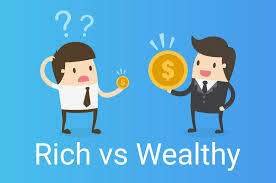 The masses seem to be less informed of the ways one can obtain wealth so instead they SETTLE for just being rich or simply aspiring to be rich. To view being rich as a destination would be to sell ourselves drastically short. Happiness, health, family, knowledge and other non-money things can create great wealth for those who desire it. Given a choice, I choose wealth any day. The reasons above are an inkling of the rewards over being rich. The next question is not how to become rich, but how to become wealthy?